Serendipitous art! Isn't the position, color and shape amazing? It almost looks like the sign grew there. Oh, I know! I felt the same way when I saw that sign ... let's not even think about where to put the thing, or how many thousands of dollars it would cost to fix it up. It must be saved! 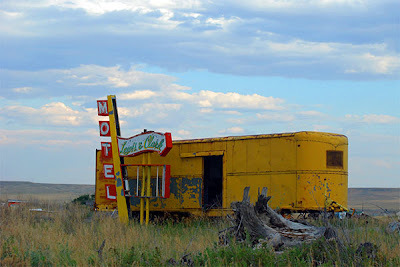 And Nick, if you ever saw the real Lewis & Clark Motel, you wouldn't think that this setting is really too much worse than the original!